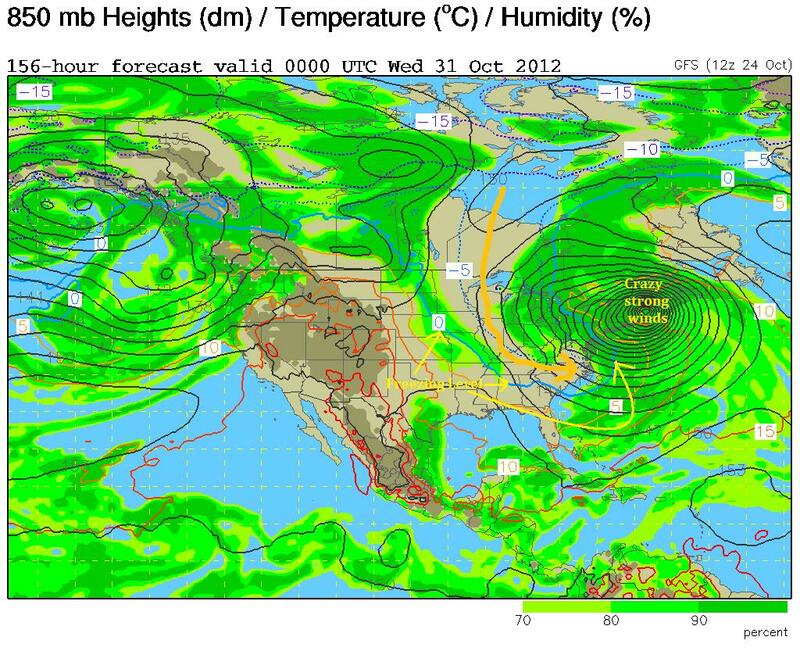 Stuck In The Buckosphere: Hurricane Sandy mean snow for us? This entry would not be worth any weight if I did not mention Hurricane Sandy. As I write this it is a Category 1 Hurricane between Jamaica and Cuba. It will not be directly influencing our weather pattern for the Ohio Valley... indirectly, yes, it likely will. 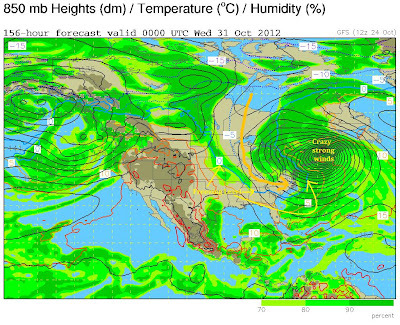 The GFS and CMC, two long range forecasting models are both showing Sandy getting VERY strong as it moves up the eastern coastline. For those of you who read my blog remember my bowling analogy. Forecasting one day is like walking halfway up the lane... a normal bowling lane is like forecasting two days out... so Sandy is looking to influence the weather here in the Ohio Valley a week from now... three and a half bowling alley lengths... so the chances of this being a strike now... almost a shot in the dark... BUT there is hope, and I will explain why. So what does this mean for us... well the next graphic will help with that. It is the predicted precipitation for the next 7 days and I put the last 3 GFS models next to each other to compare the model output for Columbus. We will be seeing rain come in late Friday into early Saturday. That will be with the cold front cooling us off a lot. 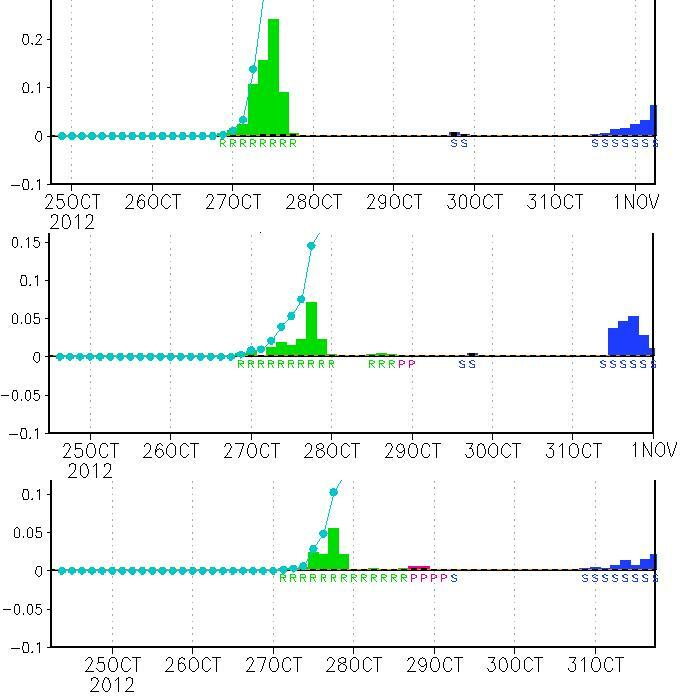 The snow arriving on Halloween would be an influence from Sandy. BUT here are my thoughts of why I think we WILL see snow... 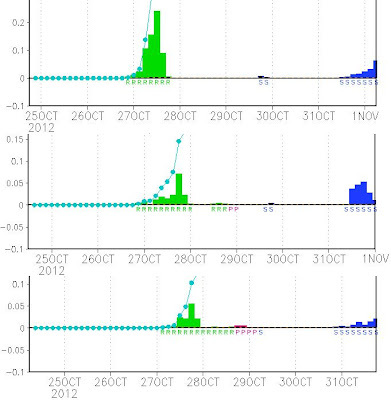 The last outputs from the GFS has been staying true and holding on to the forecast for snow. The CMC (Canadian model) also is showing a similar output. The next is kind of a backwards thought... but I will explain it as best as possible. In our "first snow" talks in recent years here on the Buckosphere I am always skeptical of those clipper systems. They swing down from the far Northern Plains in Canada and come down towards the Ohio Valley and then turn back north head toward New England. The first couple clippers always tend to NOT dip as far south as the models forecast. They have a hard time cutting into the warmer environment so I am ALWAYS skeptical of the first couple clipper systems of the year. Something they never taught in class, just something I learned form experience and something my dad (B.S. in Meteorology from Purdue) taught me back when I was in middle school and high school. So for those of you who heard me a skeptic a the last couple years for this reason, throw that out the window...for now. This system is an exception to the rule. The system will NOT be coming from the Alberta, but will actually pull in Atlantic moisture and is quite intriguing. Either way I will be watching it closely and stepping up my blog entries and tracking this along with you, so I hope you check back in often. Also, as far as who sees snow and how much... total shot in the dark, but according to the models, ALL of Ohio could see a few flakes, but the farther north and east... the better chance for more with the stronger wrap-around.... but too close and you will be in the warm core of the storm. So I do not even want to put any numbers out there. One degree to the right for this storm and that could mean a HUGE change in the storms path 1000 miles further north. So enjoy tomorrow... I called for low 80's and near record temps... then it gets cooler Friday with the rain later and I am not looking forward to tailgating on Saturday for the Ohio State game... not going to be the best weather... We then stay dry until the middle of next week with the previously mentioned system. I would like to appologize for any typos or gramatical errors since I can't proofread this, but Dawn is not feeling well so I am going to go be a good husband and see what I can do... Have a good one!